The Nano Engineering and Storage Technology (NEST) research group (formerly the Electronic and Information Storage Systems) has research interests in nano fabrication for data storage and advanced sensors applications and the investigation of data storage systems in general. 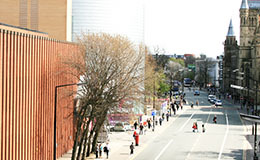 We are housed in an integrated suite of staff offices, general-purpose laboratory space and class 100/1000 cleanrooms, and are a founder member of the Manchester Centre for Mesoscience and Nanotechnology, where the ground-breaking Nobel Prize winning work on Graphene by Andre Geim and Konstantin Novoselov was undertaken. The centre is based in the group’s laboratories, and offers a wide range of facilities for the fabrication, visualisation and characterisation of structures and devices containing individual elements from a few microns down to 10 nm in size. As well as the nanoscale fabrication facilities available through CMN, we have facilities for characterising magnetic media including a purpose-built alternating gradient field magnetometer, a purpose-built magneto optical kerr effect (MOKE) magnetometer, and an ADE Technologies vector vibrating sample magnetometer. The observation of nanoscale magnetic skyrmions at room temperature is an experimental breakthrough and can serve as a robust basis for the development novel devices for memory and logic applications. Such thin-film skyrmions can lead to ultra-dense, ultra-efficient, non-volatile spintronic devices that are particularly relevant in a greener, more energy-efficient future for information technology devices. While the use of dominant storage technologies like the hard-disk drives, in which information is encoded magnetically, enables the storage of zettabytes of information, this technology will soon reach its limits and therefore demand for radical new avenues to store data is pressing. The ultimately small size of the skyrmions, as well as their robustness against defects due to their topology and their ultra-efficient mobility under electrical currents make them excellent candidates. The prime candidate for such a device is to the so-called "skyrmion racetrack" memory, proposed by Albert Fert in 2013. In this work we designed cobalt-based multilayered thin films in which the cobalt layer is sandwiched between two heavy metals in order to achieve additive interfacial Dzyaloshinskii-Moriya interactions (DMIs), and a large value close to 2 mJ m2 in the case of the Ir|Co|Pt asymmetric multilayers. For this purpose we employed advanced nanoscale magnetic X-ray imaging in large Synchrotron facilities to systematically investigate the evolution of magnetic domains and magnetic skyrmions size with magnetic fields. Their behaviour in a perpendicular magnetic field allows us to conclude that they are actually magnetic skyrmions stabilized by a large DMI. This lead us to also introduce/stabilise magnetic skyrmions in racetracks, bringing us a step closer to moving them in the future in order to demonstrate the first proof-of-principle skyrmion memory device. This is a collaboration between the University of Manchester, the Paul Scherrer Institute and the Unité Mixte de Physique CNRS/Thales (UMR137). Team leaders are AF, VC, CM. EU is acknowledged for support (EU FET OPen MAGicSky 665095). For general enquiries please contact members of the group directly. The NEST Group is based in ground floor of the IT building, building 40 on the campus map, with access via the Kilburn building to the 4th floor of the IT building. The University of Manchester website has detailed travel instructions. When travelling on Oxford Road from the city centre you are heading South, and the Kilburn and IT buildings will be on your left. Clean room banner image licensed under CC BY 2.0 by Robert Scoble.